There are a number of job vacancies currently being advertised for commencement in 2018. Please refer to the “Current Vacancies” page on the website for more details! Fees for 2018 are now confirmed, please see below. Rachael will be continuing to contact families to receive updated information on all students medical and dietary information. As a part of this communication we will be requesting Immunisation Status Certificates for all students where we do not have this on file already. Your cooperation is appreciated with this. 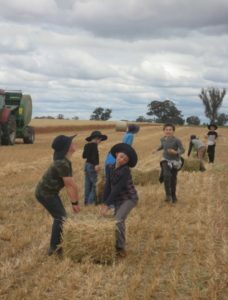 Last Thursday, Class Three enjoyed a wonderful field trip to the Perry Farm to do some harvesting as part of a Farming main lesson. Thanks to Brad and his family for allowing us to come and participate in these hands on farming experiences. 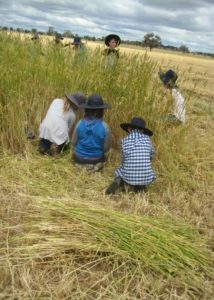 The children and I gained a rich insight into the crops grown at Goornong and a highlight was walking through the field of wheat before harvest. Thank you also to Laurel who accompanied us. Your assistance and delightful company was greatly appreciated! Class Five have had in the last couple of weeks, a wonderful time in the great outdoors – Our cycling camp from Pyramid Hill to Terrick Terrick National Park (around 50 kms in total) showed what great strength of character and determination each student had. They helped each other out, worked together and cheerfully overcame any obstacles in their way – and we only had one puncture! Last week we visited Yanga National Park and had an amazing 4 days living on Aboriginal Land, listening and talking with Ron Murray’s relatives who taught us about animal tracks, Aboriginal history, told stories and showed us dances. We walked the land, listened to the many birds, tasted some bush tucker (well done Nakomis and Lola for trying the Witchetty Grubs(! )), visited a burial site and the largest Shearing Shed in Australia on the station that Ron’s father worked for many, many years. We went to sleep under the soft glow of the moon and shining stars and awoke to morning bird songs and a rising sun. A truly fulfilling experience. Thank you to Ron for sharing some of your land and history with us. In the coming weeks we shall be gearing up for the Greek Olympics, so still much outside work to be done. Term 4 has been a cultural term for the Spanish program of our school. Classes 1 to 3 have been learning a Christmas carol in Spanish and hearing stories about the way Christmas is celebrated in Mexico. During the second part of this term they will be setting up a little Christmas tree and a nativity scene as part of this experience. Classes 4, 6 and 7/8 prepared themselves during the first four weeks of the term, for the festival of the “Day of the Dead” (La fiesta del Dia de Muertos), which they celebrated on Friday the 3rd of November (traditionally celebrated on the 2nd of November in Mexico). Now they are preparing to celebrate Christmas (Navidad) by learning a Mexican tradition called “La Posada” which involves a procession, chanting and the breaking of a piñata. Class 5, on the other hand, has been preparing a Play! Based on a Toltec legend about the creation of the drinking Mexican Chocolate. This they will perform on Thursday the 16th of November for their parents and some other classes that may be able to attend. After this date, class 5 will join the rest of the classes with the preparation for the Christmas celebrations. I hope the children are enjoying the term as much as I am :). Our French classes are well settled into the term and progressing happily. Class Six spent a pleasant day in the sunshine (yes, we did have some sunshine last week!) collecting blossoms, leaves and botanical specimens to design a page of illustrations on the topic of Mon Jardin (My Garden). Apart from discovering that the school gardens are very beautiful at this time of year, we will soon be using this experience to look at an example of a garden planted at the time of early French exploration of Australia. This will complement the Main Lesson on Inland Explorers which students are currently undertaking. And Classes Seven and Eight are working very creatively on their French children’s storybooks. We currently have topics ranging from colours of the rainbow through to birds and animals, fruit and vegetables and even a ghost storybook. We look forward to the finished results! Beautiful Organic Cotton Summer Hats for Children from Baby to Big Kids! Available online from www.woollykins.com.au or instore at Tribe Castlemaine, 227 Barker Street. UV rated, 100% organic cotton and designed for best coverage. Made in Germany. A rare opportunity. Just 5km from Castlemaine Steiner, 5km from Newstead, and 11km from Castlemaine, this charming 3-bedroom mudbrick house is set on 10 acres of gently undulating land and nestled within ~100 acres of state forest. For more info, call 0402 358 098.